Staff was very nive and helpful but unfortunatelly they could not address and resolve the exisitng problems as well as those arising from the lack of adequate management . Excellent breakfast buffet, friendly and helpful staff, clean air and beautiful property. For those who like to gamble, there is a casino on the property that operates 24x7. The new wing rooms are better than the old wing. Helpful & Welcoming Staff, Comfortable Rooms & Clean Toilets. I like its ambience. The manicured lawns and greenery give it a wonderful aura. O estilo novo, restaurado do hote me deixou mais tranquilo. Catmandu é um local onde exite muito o "antigo", e eu não gosto. As áreas de lazer do hotel são muito bonitas, tudo muito agradável e caminhar pelos jardins ou sentar se no bar ao ar livre é muito bom!. 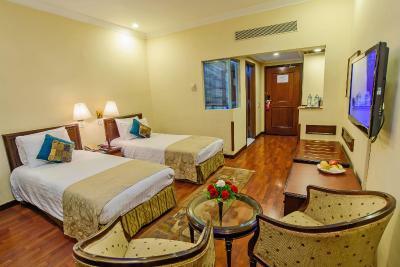 Crowne Plaza Hotel Kathmandu-Soaltee This rating is a reflection of how the property compares to the industry standard when it comes to price, facilities and services available. It's based on a self-evaluation by the property. Use this rating to help choose your stay! Luxurious accommodations in Kathmandu is provided at Crowne Plaza Hotel Kathmandu-Soaltee, spread over 12 acres of peaceful gardens. An outdoor pool, spa treatments and a fitness center are available. It also has outdoor barbecue grills and a global newspaper service. 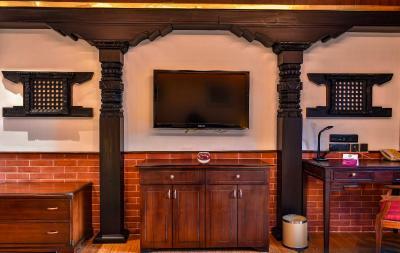 Featuring elegant decor, all the air-conditioned rooms come with a TV and mini-bar. Some rooms include a flat-screen TV, as well as views of the mountain or pool. Private bathrooms are equipped with a bathtub. Crowne Plaza Hotel Kathmandu-Soaltee is 1.9 mi from Swayambhunath Stupa Shrine and 2.5 mi from the temples at Darbaar Square. It is 3.7 mi from Pashupatinath Temple. Tribhuvan International Airport is 5 mi away. Al Fresco restaurant serves authentic Italian cuisine, while Kakori offers international dishes and outdoor garden seating. Other dining options include Hunan,Cantonese and Sichuan cuisines at Bao Xuan, and premium alcohol at Rodi Bar. 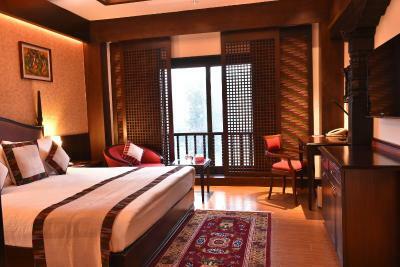 When would you like to stay at Crowne Plaza Hotel Kathmandu-Soaltee? Air-conditioned room with a TV and minibar. Private bathroom has a bathtub. Enjoying views of the mountain and pool from large windows, this air-conditioned room comes equipped with a TV and a minibar. Private bathroom has a bathtub. Includes access to the Club Lounge, with free breakfast and drinks for 2 guests. Enjoying views of the mountains, this air-conditioned room has hardwood floors and a flat-screen TV. The private bathroom has a bathtub. This suite has air conditioning, seating area and mini-bar. 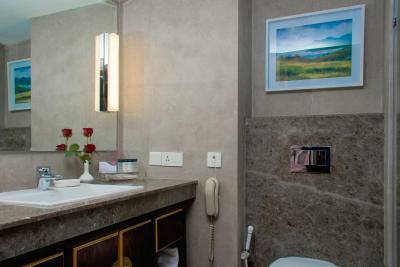 House Rules Crowne Plaza Hotel Kathmandu-Soaltee takes special requests – add in the next step! One older child or adult is charged USD 43.50 per person per night in an extra bed. Crowne Plaza Hotel Kathmandu-Soaltee accepts these cards and reserves the right to temporarily hold an amount prior to arrival. The price per night was on a very high end ($200 per night) but the room I finally stayed in on the fifth floor (had to change the first room due to the drilling and hammering noise in the walls) had a very worn out feel, with a very ugly view of construction site and accompanied by the construction noise bellow my windows that lasted until after midnight and wouldnt stop until several interventions; almost non existing wi-fi so I couldnt work in the room at all; got stuck in elevators twice due to power outage as clery no generators in the hotel; dirty mugs in the room; a very late cleaning service for the room and for which I finally had to ask for etc. etc. In my opinion, hotel was not able to provide the quality of the stay for the price they charges - it advertises itself as a conference centre but it was not able to properly function when in a full capacity or to provide the quality of not just a room but even of some basic elements - the hotel toilets were most of the time not a pritty site and lacking main elements like toilet and hand paper. And finally, they were not able to accommodate my leaving early due to the family emergency and still charged me for the two nights that I couldnt use. Staff was very nice and polite and tried to compensate for the lack of overall good management of the hotel by appologising all the time and offering small discounts but unfortunately, they were not able to provide timely and satisfactory solutions and services for the overall stay. When I asked to book room at reception they did not give me correct information and offered me a room worth INR 22000 per night. So I went to booking.com and got my desired room. The hotel is too old need some repair work of furniture inside the room . Change in curtain and carpets which r very old. My luggage deposit in your cloakroom, still not sent to my office address at Delhi. Although they have 4 restaurants, the Chinese and Italian restaurants are only open for dinner. The only options during the day are the coffee shop and the poolside. Property is far from the airport and all the sightseeing and night spots. Old wing rooms are a bit rundown.